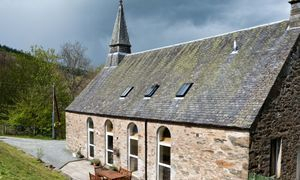 The Old Kirk in Dalguise is in a charming renovated 'B' listed 19th century church, sitting on top of a hill, commanding panoramic views of the Tay valley and Tay Forest Park in Central Scotland's "Big Tree Country". The main part of the Old Kirk is available for self-catering holiday lets and sleeps 9+ cot in 4 bedrooms (7 beds). Children and well behaved pets are welcome. Please see the full description of the spacious interior, private gardens and amenities on The Cottage page. Please check out our availability and pricing, as well as our glowing reviews! Once you're convinced that it's a great place to stay for your next weekend or week-long break, enquire here. "The most fantastic stay we've had anywhere in our 26 years of marriage!"